Graduates of medical schools in Israel. Graduates who also hold a PhD. Graduates who belong to a couple, and prefer to be assigned to the same hospital as their partner. Graduates who have kids, and prefer to be able to continue living in the same geographic area. Some of these groups were traditionally guaranteed special terms when matched with an internship. Specifically, up to five graduates with a PhD (or in some years: five excellent students) were allowed to pick any hospital of their choice. In some years, parents were allowed to stay close to their current residence. Finally, couples were allowed to be matched to the same hospital. Being part of a couple was self-reported, and some interns pretended to be a couple in order to share an apartment with friends during the internship. The internship is perceived as a tax that must be paid. Interns work night shifts and weekend shifts, receive a minimum wage, and usually do not benefit from any guidance or further training. There is also (almost) no correlation between the hospital in which the internship was performed and the hospital in which the residency is performed (the latter being crucial for the medical students’ career path). By and large, interns are not assigned to hospitals on the basis of merit, since the government wishes to equally spread talented interns across the country. Who are the participants? Graduates of medical schools. Stated objectives of matching policy Fairness among doctors, equal spread of talent across the country. Who’s in charge? The Ministry of Health and a committee elected by the student body. Available capacity Same as the number of doctors (≈500 local grads + ~200 foreign grads). Timing of enrolment May of every year. Information available to applicants prior to enrolment period Description and code of the mechanism, summary statistics of previous years. Restrictions on preference expression Students must rank all hospitals. Priorities and quotas Proportional to hospitals’ size, and extra for periphery. Further special feature Couples are to the same hospital. The current mechanism used to assign interns to hospital has been in place since 2014. Following the authors’ advice, the Ministry of Health and a committee of students elected by the student body decided to try a new algorithm that is more efficient in the sense of giving each student better chances of being assigned to the hospital she prefers. The new algorithm is similar to a mechanism called Competitive Equilibrium from Equal Incomes (CEEI), in which participants trade in probabilities for being assigned to different hospitals. The Ministry of Health and the committee were convinced to try the new mechanism after seeing simulation results based on preferences data from previous years. The two cohorts (local and foreign graduates) enter independent matchings that use the same mechanism. The authority in charge of actually running the software and sending the results to the interns is the Ministry of Health. The mechanism works as follows. Students submit a rank-order list (ROL) containing all available hospitals in their order of preferences. The mechanism then first runs the serial dictatorship for several random orders (with PhD holders choosing before other students and couples still submitting only one ROL as in the old mechanism). These trials are used to approximate the assignment probabilities under random serial dictatorship (RSD): if the number of trials is equal to N, then the approximate probability that student i is assigned to hospital h (p_(i,h)) is equal to the number of trials in which s/he was assigned to that hospital, divided by N. Together with reported preferences, these approximate probabilities allow the algorithm to compute students’ expected utility from RSD (the structural form of this utility function was evaluated in a one-time survey in 2013). 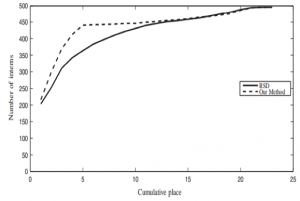 In a second stage, the algorithm uses reported preferences to evaluate the utility of each participant. The algorithm then maximizes the sum of these utility functions, subject to the condition that no student’s utility goes below her expected utility from the RSD allocation. For example, it is possible that students A, B both agree on their first and tenth preferences, but A’s second preference is B’s ninth preference. Suppose that A gets her top choice with probability 5%, and gets her tenth choice with probability 5%. Suppose B gets his 9th choice with probability 10%. Both sides would probably be better off if B “transfers” his 10% in the ninth position to A, and A “transfers” her 5% in the top position and 5% in her tenth position to B. Doctor A lost some probability on her first place and some on her tenth place, but received a large increase in the probability of getting her second place. This is preferable for her if the first and second places are rather similar for her. B received some probability for his first place and some probability for his tenth place, but lost a lot of probability for his ninth place, which is a good deal for him (assuming that places nine and ten are similar for him). The mechanism makes similar assumptions, and under these assumptions performs the trades. The output of this optimization phase is a vector of probabilities for each doctor; namely the probability that each doctor will go to each hospital. We then turn these probabilities into a lottery. This is not trivial: if both Alice and Bob go to MGH or to Mount Sinai with probability 0.5 each, it is not possible to independently flip a coin to determine where Alice goes, and then flip a coin to determine where Bob goes (they must go to different hospitals). To create a correlated lottery, we apply the Birkhoff-von Neumann decomposition theorem [1,4]. Finally, it is required that doctors will be able to randomize as a couple, and end up in the same place. This means that the simple version of the theorem does not suffice. Instead, the mechanism provides a polynomial time approximated decomposition algorithm . Using choice data of 2013 (still under the previous mechanism), RSD assigns on average 203 interns to their first choice hospital, 50 to the second, and 59 to the third (with the rest of the students receiving positions up to their last choice). The new algorithm assigns on average 216 interns to their first choice, 84 to their second choice, and 70 to the third choice. The expected improvement in ranking for the average student of the new mechanism compared to the previous one is 0.91. 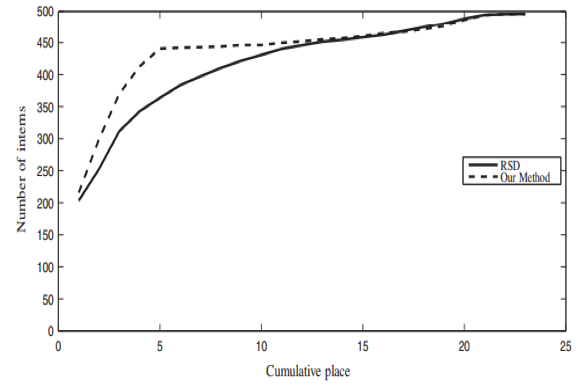 The figure below depicts the accumulative rank distribution. Before 2014, medical internships were assigned using a variant of the Random Serial Dictatorship (RSD). PhD holders got to choose before the mechanism was ran (equivalent to being placed at the beginning of the queue). Couples submitted only one rank ordered list (ROL), and were treated within the mechanism as if they were one intern who takes two seats. In some years parents were allowed to choose to stay in the geographical area of their residence, but they were not promised which hospital they would be assigned to. The process was first implemented manually (gathering all medical students in the same hall at one of the medical schools and pulling names out of a hat), and was computerized in 2009. One important issue with the previous mechanism was the (illegal) practice of selling and buying internship positions after getting an assignment (the buyer and seller pretended to be friends exchanging positions voluntarily, but money was being paid under the table). Such deals were initiated both by buyers and by sellers, using internet forums to find suitable partners for exchanges. Allegedly, the cost of an internship position in one of the top hospitals in Tel-Aviv went for as high as 40,000 NIS (roughly equal to $10,500, and equal to seven months of intern salary). This phenomenon caused the Ministry of Health to ban any exchange that involves students who were assigned to one of their top four choices, starting from 2013. The new mechanism sacriﬁces some degree of truthfulness for increased efficiency. That is, the outcome is more efficient if reports are truthful, but some participants can receive a better lottery if they misreport their true preferences. This is true even though the market is large. This concern was voiced also by the participants who realized that the mechanism is not strategy-proof. However, according to anecdotal evidence most interns fail to understand what would be a good strategy. They do study summary data from previous years, but they often misinterpret it (e.g., they note that nobody gets the most demanded hospital unless they rank it first, and they mistakenly attribute it to the non-strategy-proofness of the mechanism, even though the same phenomenon occurs under RSD). We believe that in this market the gain in welfare is big enough to warrant some degree of untruthfulness. Another issue that led to concerns of the interns regarded the transparency of the mechanism. Two measures were taken: First, the source code for the matching software was released. Second, in the first two years of operation, the program did not output one assignment but rather a million assignments. Representatives from the different medical schools had access to these assignments and could verify that the marginal probabilities are indeed as expected. Then one of this one million assignments was selected at random. After the Ministry of Health gained more trust in the system, this procedure was deemed unnecessary and it was not used anymore. All data belong to the Israeli Ministry of Health. Summary data about previous years are sent every year to participants before the match, but are not published otherwise. The authors have one or two such reports (in Hebrew) which are available upon request. The description of the mechanism appears in , and a discussion on how to treat couples appears in . Bronfman, S., Alon, N., Hassidim, A., and Romm, A.,2015. Redesigning the Israeli Medical Internship Match. In Proceedings of the Sixteenth ACM Conference on Economics and Computation, 753-754. Bronfman, S., Hassidim, A., Afek, A., Romm, A., Shreberk, R., Hassidim, A. and Massler, A., 2015. Assigning Israeli medical graduates to internships. Israel journal of health policy research, 4(1). von Neumann, J., 1953. A certain zero-sum two-person game equivalent to the optimal assignment problem. Contributions to the Theory of Games 2, 5–12.